If you’ve made the mistake or inherited a deck with a painted or stained surface you can remove that paint or stain and bring your deck back down to the wood. When we come to look at your deck we will do a test spot. A test spot will help us judge what was applied to the deck in the past and how easy or hard it is to remove. It will also help us decide which stripper is best for your job. For instance, Sikkens is one of the hardest finishes to remove along with acrylic and solid stains, whereas Thompson’s Water Seal and other paraffin wax seals are much easier. We use different removal processes for each. The test spot will also let us see how many coats of film forming finishes were applied over the years and how unevenly they may have been applied. It helps if the homeowner knows some of this information, for instance, if you did it yourself you may have the can of sealer in your garage. Oftentimes we immediately know by looking, but other times the history is beneath many layers of finish. After we strip the deck, the deck will need to be neutralized, then sanded and buffed before we can apply an oil to it. Neutralizing balances the pH of the wood and also gets rid of any tannin marks and rust stains. Tannins occur naturally in hardwoods and leach out over time causing dark stains. Neutralizing also brightens the wood. After neutralizing we may need to push in any nail heads that are too high on the deck before we buff or sand it. Buffing the deck will remove any furring of the wood caused by using the stripper. Sanding is done if the deck has been neglected for a long time or if some finish still remains on the deck. It will remove a light layer of wood and even it out. The last step is to oil. After the deck has been prepped we can then apply the oil. The wood needs to be below a certain moisture content before applying. This may mean waiting a few days before this step can be done. 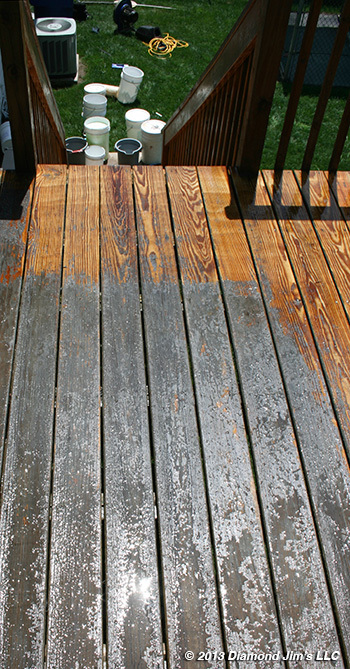 After we apply the oil you should not walk on your deck for two days to avoid tracking the oil into the house. After two days you may put your furniture back on the deck. We’ve created a detailed step-by-step visual photo gallery so you can see the complete process of deck stripping from start to finish. We also have a deck envy portfolio of our completed jobs. Some of these were total deck restorations that needed to be stripped. This deck has an ugly finish that we were called in to remove. Here you see the test spot we did do see what it would take to dissolve the finish. You can see there were varying thicknesses of stain applied from the appearance of lap marks. We need to go around the deck and use a porter cable paint remover to treat some spots where the finish was thick. The bulk of the old sealer has been stripped off. We are now buffing and sanding the deck. The deck is now finished being prepped. We are ready to apply an oil. This is the completed deck with a dove gray oil applied. It is the same spot as the first photo where we did the test spot. Diamond Jim’s Pressure Cleaning can handle all of your paint stripping and deck restoration needs. If you are considering stripping your deck in Connecticut and would like to talk to us, call us today at 203-754-4284 or 860-354-0855 or complete our online form.